I am out of steam. Pregnant for the second time, with mini Basu turning into the Tasmanian Devil. Mega intense book launch in India following a short break with the family. And never mind the PR job. But let me put the violin away for a moment. There are lots of positives to report. Miss Masala is now up there with "Hot Desi Masala" in Google searches. Summer has been short but brilliant fun. And I've been cooking loads. Just eating it all too quickly and passing out straight after! This is one of the recipes that proved a hit when a girlfriend came over to discuss urgent love matters. 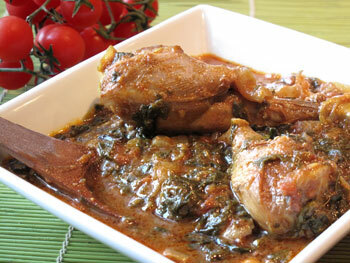 A lightweight, meal-in-one Palak Murgh or chicken curry with spinach. Of course, who thought to take a photograph or, more importantly, make a note of the recipe at the time! So try two, I rustled it up again for a mid-week dinner ticking all above boxes. Except this time I dived in cooking sans shower cap and eating with fingers, forgetting the big client meeting the next day. I swear his nose twitched as I quickly greeted him with an air kiss. The Palak Murgh emanating from my now truly luscious locks came a close second to the aromatic but turmeric-stained fingernails I was sporting. Still, this curry was worth every moment. Here's to more where it came from... PS = You can use diced chicken thighs in this recipe but the end result will not have the same depth. Chop the onions roughly and mince finely the ginger and garlic. In a pan, bring the oil to heat on high and when it starts sizzling when touched with a wooden spoon, add in the bay leaf, cinnamon and sugar. As the sugar caramelises within seconds, chuck in the chopped onions and stir viciously for five minutes. Next add the ginger garlic and fry for another five minutes until the whole mixture turns a dark shade of gold. Then chuck in all spice powders apart from the garam masala and fry for another five minutes. If the spices start getting stuck to the bottom of the pot, add a little hot water and scrape off. Now, roughly chop the tomatoes and add them to the pot along with the puree. As the tomatoes disintegrate, throw in the chicken thighs and drumsticks and mix the whole lot into the masala to brown evenly. Then add half a cup of hot water, lower the heat to medium and cook for 20 minutes to half an hour covered, stirring every five minutes, until the chicken is cooked. You will know because the chicken will separate from the bone on the drumstick, but it’s always worth cutting a piece up to be doubly sure. When the chicken is done, mix in the cooked spinach, add garam masala and salt to taste and simmer for a final five minutes until oil floats to the surface. Enjoy with rotis someone else prepared or in my case, a big bowl of steaming hot Basmati rice. Glad you are having such a successful and happy life (albeit busy), Mallika! You totally deserve it! OMG…you just vanished from the blog.glad you are back.i have been following your blog & have tried quite a few of your recipes.I have really enjoyed them and your writing as well.keep posting. PS: Your enthusiasm & energy to do so many things is really inspiring. Congrats Mallika. great that you are enjoying a busy yet fulfilled life. love reading your posts but take good care of yourself. perfect spinach chicken. Glad to see you’re back…I’ve been following and subscribed to your blog since almost your first post and I admire you for managing to do all this with a job and 2 kids in tow! Wow! I have a 15-month-old, a freelance writing job, and I’ve just started a food blog of my own, so I totally get you! Keep writing new posts and all the best for your family! I’ve just road-tested this recipe and think that adding some peppercorns to the initial oil gave it a deeper flavour. I have just purchased your book and I’ve had a bit of a read already – it is witty and charming! It is just perfect for people like me! Hi Mallika. Been lurking on you site since I got married 3 years ago. I’ve enjoyed reading your witty posts & have tried your recipes (for which I’ve received many compliments from my hubby & in-laws. My husband has said the Tadka Dal is the best he’s ever had– even better than his mum’s!) 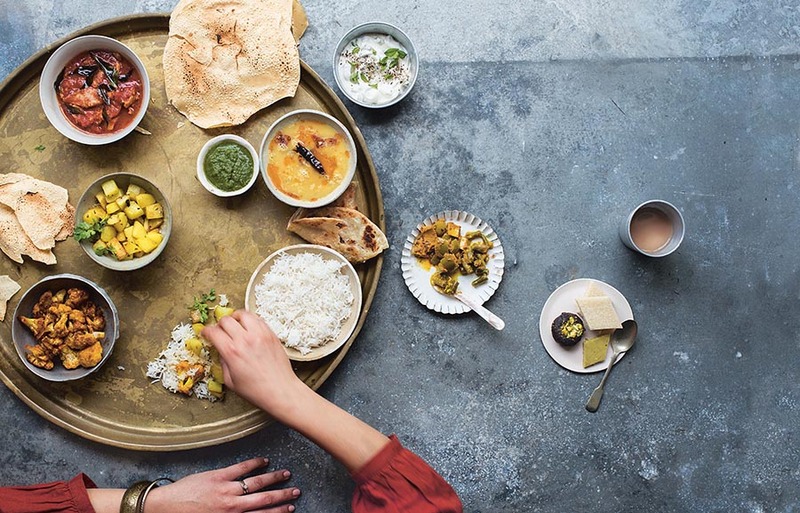 Your blog has been my go-to place whenever I need a curry fix & that happens quite often. Your book is never far from my reach in & out of the kitchen as I simply enjoy your style of writing. I just want to thank you for sharing your recipes and making Indian cuisine accessible to the once-uninitiated like me. Without you knowing, you’ve had such an effect in my life. Just cooked your Kerala Chicken curry and my 2 little boys are gobbling it all up!!! Thanks again. I just want to say I LOVE the new colours and look of your blog. They go well with the book cover, as you no doubt intended, you clever thing. I agree with the comment above. Don’t apologise for not posting because we all understand what it is like to be busy (manic? frantic?). The book launch in India sounds amazing! I also agree with the comment that says your book is witty and charming. Yes! I still intend to cook a dish from your book and big it up on my blog. Have faith! (I have a backlog of posts to write not to mention being an (unpaid) carer and the freelance web editor job….OK those were my violins). In the meantime I urge those who want to learn how to cook authentic Indian dishes in a quick, simple and accessible way, to….buy your book! As a bonus, the book is beautifully designed and makes you laugh. This looks amazing! I wish I had a plate in front of me now.. Perhaps I will have tasted this recipe by the weekend! I’ll keep you posted! Bright opinions here. I wish there are more and more articles like that. This recipe sounds absolutely delicious! Definitely will be trying this soon! Ever since I stumbled across your website and tried the recipes, I have officially become an “amazing cook” according to my husband and family. Even my dad, who owns an Indian restaurant and is a notorious food critic, gave me glowing compliments. And the truth is that until I got married and had to cook for my husband, I never stepped foot into a kitchen to cook anything! Thanks again and congratulations on all the amazing things happening in your life!!! More spinach! Now I am craving it! Look amazing! I made this last Sunday and it was fantastic! Thank you for (another) wonderful recipe. Its interesting to see how many similarities there are between words, names, and recipes from one Middle Eastern nation to another. I am an Armenian from Iran and delight at reading your jottings. Amusing and with good recipes too, keep it up and good luck in motherhood. I’ve just drunk a toast with our favourite Yemeni Matari coffee from our regular supplier The Tea and Coffee Emporium. I suspect it may well hit the mark with you too. I’m glad to get whatever we can whenever we can get it from you! Always a treat in our house when you bring new recipes to us! I am a student at the University of Edinburgh and I just wanted to say thank you for your recipes. I don’t miss my mum’s cooking as much now! Just discovered your blog today, I am a lapsed Indian with English husband trying to cook home style food for the first time in a decade for my Khala who is sick, so been scouring the internet for recipes! My poor clueless husband is wandering round the local late night supermarket looking for tinned puréed spinach and a shower cap courtesy of your blog. Love that last tip, my usual hoody I wear for cooking gets a bit hot! Very funny writing style which I have enjoyed hopefully recipes will work too. I just made this for dinner tonight. I am on a strict low cal/low carb diet and have been scanning food blog after food blog looking for good candidates. After subbing out the sugar for some splenda (and some canned diced tomatoes for the puree), this was perfect. Super flavorful! Not like diet food at all. Thank you.